A father and son play during Lego Night. 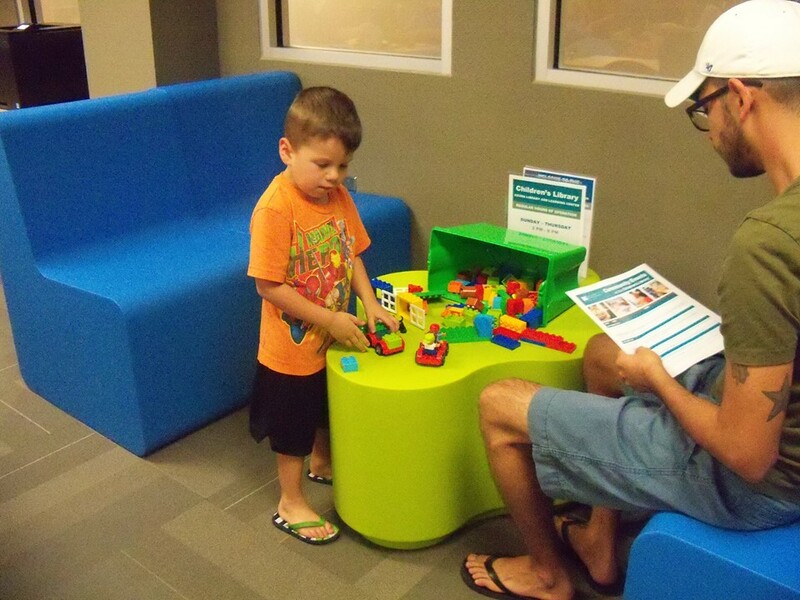 Children of all ages are invited to check out Palo Alto College’s newly renovated Children’s Library located in Room 119 of the Ozuna Learning and Academic Center. “Our main thing is it’s all about family,” said Melissa Moya, Library Assistant III. Moya and the rest of the staff are dedicated to ensuring they provide a fun, safe and engaging environment. Events are held every month to bring families together to have fun. One big event the library hosts is Family Game Night. Moya encourages parents to bring their children to enjoy playing different types of games together. The games include Break the Ice, Monopoly, Clue and Jenga. The next Family Game Night will be on Wednesday, Oct. 21, from 5 p.m. to 7 p.m. The last Family Game Night for the fall semester is Wednesday, Nov. 18, from 5 p.m. to 7 p.m. The library also hosts a Lego Night. Bring the family to see who can build the biggest city or the best car. Duplo Legos, large Legos for toddlers, are provided for smaller children. The next Lego Night will be held on Wednesday, Dec. 9, from 5 p.m. to 7 p.m. The Children’s Library also hosts readings. This month Moya will read “The Spooky Wheels on the Bus” by J. Elizabeth Mills on Sunday, Oct. 18, starting at 3 p.m. Children will be given Halloween crafts to create in the spirit of the holiday. There will also be a reading for Thanksgiving on Sunday, Nov. 15, from 3 p.m. to 6 p.m. Moya will read “There was an Old Lady Who Swallowed a Pie” by Alison Jackson. Afterward, children will create a flipbook to recreate what the lady ate. In December, the Children’s Library will host a craft night to celebrate the winter holiday season on Sunday, Dec. 6, starting at 3 p.m.
“Children being read to at an early age has huge impacts on their own desire to read,” said Dr. Amie Deleon, an associate professor of Teacher Education at Palo Alto College. Encouraging children to read starts at home when they are young. The Children’s Library is committed to encouraging children to start reading at an early age and continue as they get older. “Starting by looking at the pictures and developing a story from the pictures, children start the reading process,” said Deleon. Board books are available for parents to read to their babies and toddlers. The Children’s Library is open Sunday through Thursday from 2 p.m. to 8 p.m. The 1300-square foot library has a variety of ways to make sure children and adults are able to benefit from the resources available. The library has books geared for children from birth to age 14. Desks are available if the parent would like to bring his or her laptop and work on something while the child is reading. Computers are provided for anyone to use. Alamo College students are able to check out books for 21 days. As long as the book is not on hold, they are able to renew their check out once. Non-students are also able to check out books as long as they have a TexShare card, which is available to anyone at their local branch. A non-student is able to check out books for 14 days. The library will soon have Nooks available for check out. For more information on the Children’s Library, email Melissa Moya at mmoya8@alamo.edu.